I've branded a new project before it's even a day old! When I was thinking about my new art journal and looking up new techniques on the youtubes, I felt constrained when I thought of having to mark a date on a page when it was worked on and then "not being able to add to it" on another day if it was already dated, cuz then I'd have to keep track of dating it again. I know, right? So I stumbled upon the branding of "Q2". The sales peeps at the office/"artist-in-residence-work-contribution" job were finishing up their quarter and get to take Monday off for reaching their goal. (The mention of a day off is what got me to daydreaming.) I figured, perfect! A selection of time I can easily house my project in, work across all pages as needed/desired in that 3 month period, quarter two, Q2 was born! So that's what I painted on the cover of my art journal. 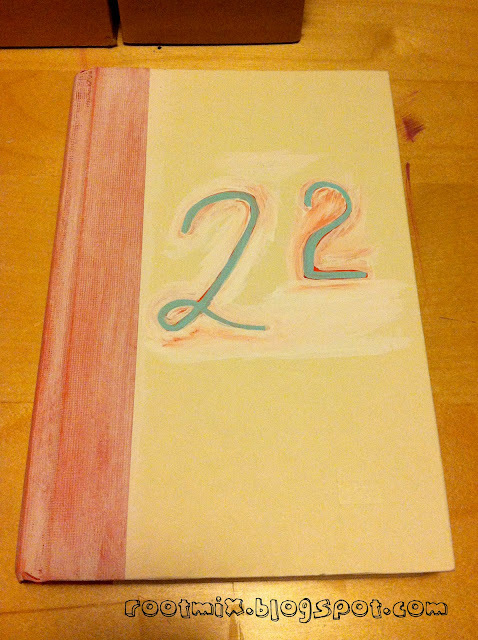 My Quarter Two art journal. starting my art journal today (again). Before leaving one of my wellness team member's office today, she told me about some vulnerability journaling she had learned from a certain website. Having had just gone through an emotional exercise, the thought of exploring vulnerability on purpose made me nauseous. I wanted to thrown up. I told her as much and knew at the same time journaling about my vulnerability would be the next step to care for myself. When home, I searched in many resourceful ways for the exact exercises she may have used, but came up with nothing to match. I did, however, embark on some spiritually fulfilling side-tracking and have found a couple new inspirations. And was reminded of an old inspiration from many years ago. 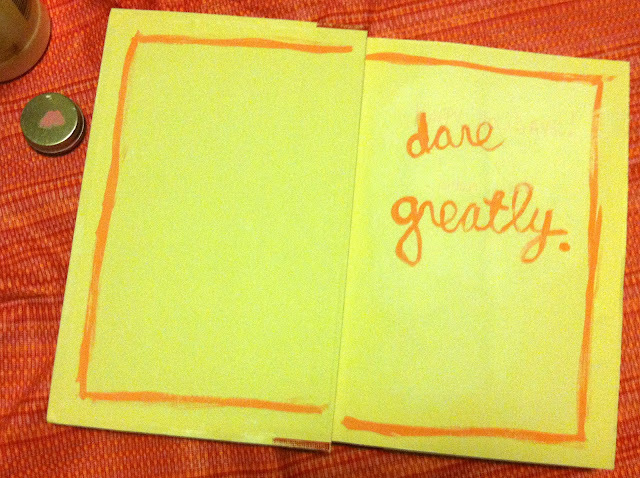 And then I spent the evening prepping my art journal. 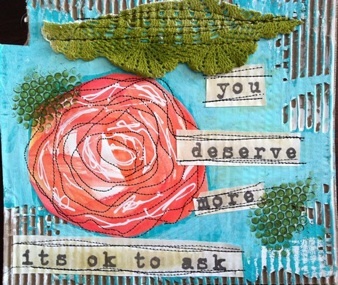 My search lead me to a girl and her brush and Wendy Brightbill's latest entry "journal challenge 158/journal entry: embrace vulnerability" Right? I looked up flights to see if I could make it to her Becoming art journaling workshop as my birthday adventure. That's how much I instantly identified with her work. When talking about her workshop, she mentions Brene Brown. And that becomes my next stop on the internet side-tracking. I quickly find Brene's TED talk and my new heroine. If you'd like to watch something that is highly likely to move you, take a look at her video. After watching this, I tweet a quote I hear and then *need* to start an art journal to capture additional quotes, practice/discover my art journaling techniques (like Wendy), and think back to 2007 when I first came across Suzi Blu and her quirky art videos. Here's a perfect sample of her important message - art is most fulfilling as part of everyday life and we all have the capacity to create. I may share more about my process for getting started with my own art journal tonight. But for now, here's a picture on my inside cover. And I've prepped a good starting amount of pages. The quote is from Brene. Let me know what you think of this collection of inspiring ladies. Are you moved to make anything creative or see your situation in a different way? I'd love to hear how you are courageous and creative! Nicki's voice is beautiful in this! The one time I'm appreciating Hall & Oats. And loving the harmony banter and key twinkling :) Thanks for the link Steve! what i learned at work today.